A killer whale attacked a seal by launching it roughly 80 feet into the air with its tail fin. A video follows a group of Orcas, before showing one sending a seal flying. The seal then makes a large splash as it smashes back down into the sea. 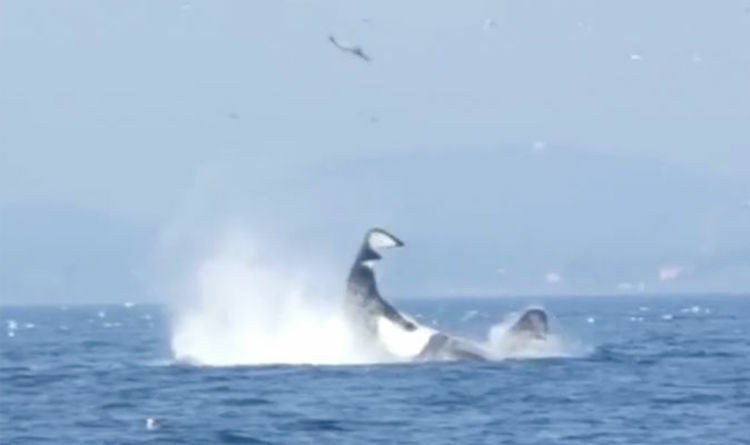 A Twitter user shared the video, saying: “An Orca tail slapping a seal 80 feet in air”. Other users were quick to express their concern over the seal’s fate. This is not the first time a killer whale has used its tail fin to strike seals. Rüdiger Riesch, an ecologist at Royal Holloway, University of London, explained the tail-strikes are used as part of a hunting technique. He said: “A lot of marine mammals, like seals and sea lions, have very sharp claws and teeth, so killer whales are at risk of suffering a severe injury when hunting these prey. “Therefore, the safest course of action is for the killer whales to debilitate their prey before getting anywhere near them. “To do this they use a combination of rams, often head-on, and slapping the prey with their flukes, or tail fins. The technique can also be passed on to the killer whales’ young.